Router1 runs VRF-lite with two interfaces, one connecting to VPN5 and the other to VPN7. The is a CE device connected in VPN5 with an IP address of 150.50.15.5, and another CE device in VPN7 with an IP address of 150.50.17.7. Originally the intent might have been to keep the two networks entirely separate. But lets assume the need arises to allow routing between VPN5 and VPN7 but only between the ranges 55.5.1.0/24 and 17.1.1.0/24. Not the rest! How can it be done? As always there are options! Make use of Route-Targets (RTs), or Take the lazy approach with static routes. Direct redistribution between VRF-aware IGP’s on the same router, does not work as you would expect. On most the IOS codes that I have seen, IOS does not allow this. The technique that might jump to mind is route-target import/export. But what is a route-target and its purpose? A RD is a 64-bit identifier prepended to a 32-bit IPv4 address which turns a non-unique IPv4 prefix into a unique 96-bit VPNv4 prefix. A RD is the most basic requirement to activate the VRF and create the VRF tables. 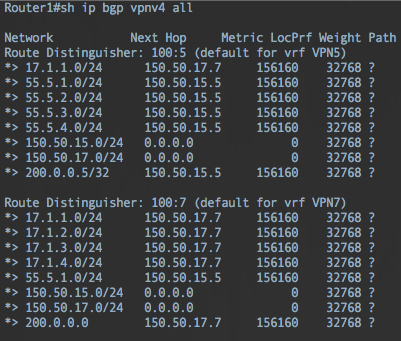 A RT or route-target on the other hand is a BGP extended community which gets attached when a prefix is exported from the VRF RIB table into the VRF-aware BGP table to identify VPN membership. The confusing part is that the RT import/export function in Cisco IOS is defined under the VRF configuration section and not under the BGP section. Thus to use RTs BGP is required. This means without BGP enabled on Router1, the RT import/export would yield no result. Another, perhaps easier option would be to use static routes within each VRF and in the global VRF. This method will route traffic out the source VRF to the global table and back in the destination VRF. The obvious other bonus is that this method does not need the BGP process to be enabled. So to test 17.1.1.0/24 should be allowed to ping 55.5.1.0/24 but no other 55.5 range. This is done by using the command “ip route vrf NAME x.x.x.x s.s.s.s nh.nh.nh.nh global”. The global keyword specifies that the next-hop is reachable via the global routing table instead of the VRF table. Let me explain, the first line says: For VPN5 to reach the 17.1.1.0/24 destination (in VPN7) go to the next-hop of 150.50.17.7 which is in the global table. 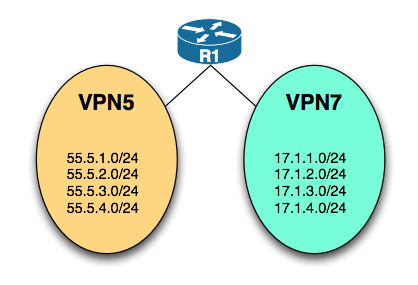 The global table will route traffic to that next-hop into the VPN7 table, as per the first set of static routes. The second line takes care of the return traffic. The only problem is VRF Select is supported only in Service Provider (-p-) images. Very useful and concise overview for me coming from an enterprise R&S background. Thank you. Would you be able to add the VRF select option to satisfy my curiosity :-) ? Great work, I wanted to implement route leak (static route) on one router. I hope this solution will work. which interface/router 150.50.17.7 / 150.50.15.5 is assigned to? Those would next-hop interface IP on the CE type devices connected downstream . The page format has somehow lost half of the post. Why are you importing the same RT that you are exporting? Is this needed? This is because of an old bug, it is not necessary to do this nowdays. Notice that I’m using OSPF as IGP. If you are simulating networks 17.1.x.0/24 and 55.5.x.0/24 via loopback interfaces, don’t forget add command “ip ospf network point-to-point” to interface configuration. Because OSPF by default advertises these loopback interfaces as /32 routes, hence they will not be matched by prefix-list. Here is example of loopback interface on VPN7 router. The “ip route vrf” is not available on Cisco Nexus 7K switches. Any suggestion?